Though we were only given “confirmation” about their marital problems Saturday evening, Bey and Jay have spent years working through them. A village of sources gave E! News the rundown about how the couple is faring post-Lemonade, and the answer—in short—is, “They’re fine!” Their marriage? Fine! Their thoughts on Becky? Who cares about Becky! Their financial situation? Better than ever! “He is fully supportive. He understands the reasoning. This is part of the process of being transparent. And they have healed. He has been very humble about the experience. 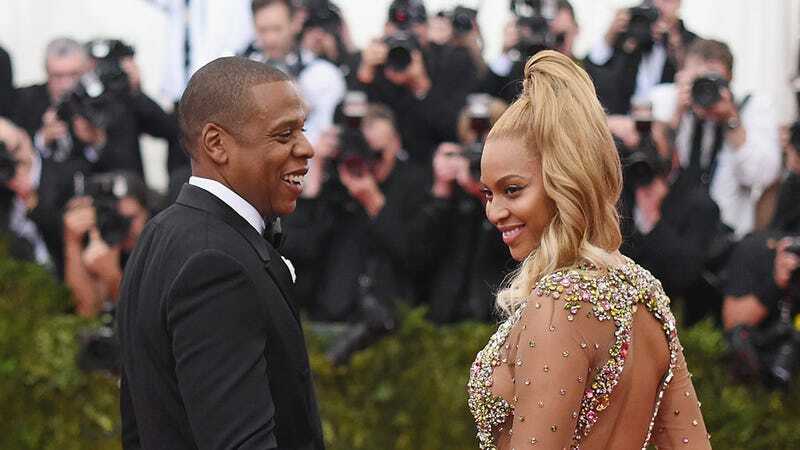 Beyoncé is the love of his life and he will do what it takes.” Another insider adds, “Jay was involved in the creation of Lemonade and knew every song Bey was going to release. He knew the lyrics; he knew the implications. He had to approve the songs before release. Jay is a very smart businessman…Bottom line is that they are both really smart and they both saw dollar signs… Jay is all about self expression, so he gets it. Beyoncé shares music before it’s released with Jay so he can listen and share his thoughts. When it comes to music, they are very in it together and supportive of each other’s craft. Good for those almost unfathomably rich and famous people for making it through their rough patch. In a clip from the upcoming season of Keeping Up With the Kardashians, we find out Rob gave Blac Chyna (aka Angela) the iPad Kendall gave him. This entire sequence is as staged as it could possibly be, and yet here I am, watching it for the second time. Anne Hathaway needs to do approximately 97% less.